Peng, D., Wolff, A., Haunert, J.-H.: Using the A\($^\star$\) Algorithm to Find Optimal Sequences for Area Aggregation. In: Peterson, M.P. (hrsg.) Proc. 28th Int. Cartogr. Conf. (ICC'17) -- Advances in Cartogr. & GIScience. S. 389--404. Springer-Verlag (2017). 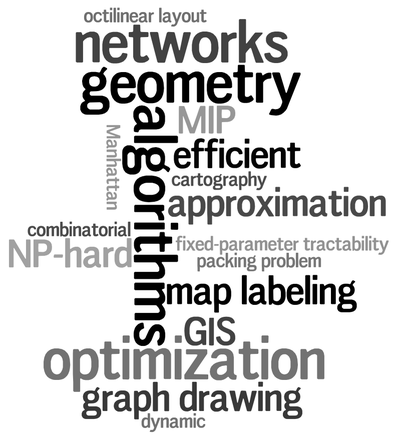 Nöllenburg, M., Wolff, A.: Drawing and Labeling High-Quality Metro Maps by Mixed-Integer Programming.IEEE Transactions on Visualization and Computer Graphics.17,626--641 (2011). Erlebach, T., Hagerup, T., Jansen, K., Minzlaff, M., Wolff, A.: Trimming of Graphs, with Application to Point Labeling.Theory of Computing Systems.47,613--636 (2010). For \($t>0$\) and \($g\ge 0$\), a vertex-weighted graph of total weight \($W$\) is \emph\($(t,g)$\)-trimmable if it contains a vertex-induced subgraph of total weight at least \($(1-1/t)W$\) and with no simple path of more than \($g$\) edges. A family of graphs is emphtrimmable if for every constant \($t>0$\), there is a constant \($g\ge 0$\) such that every vertex-weighted graph in the family is \($(t,g)$\)-trimmable. We show that every family of graphs of bounded domino treewidth is trimmable. This implies that every family of graphs of bounded degree is trimmable if the graphs in the family have bounded treewidth or are planar. We also show that every family of directed graphs of bounded layer bandwidth (a less restrictive condition than bounded directed bandwidth) is trimmable. As an application of these results, we derive polynomial-time approximation schemes for various forms of the problem of labeling a subset of given weighted point features with nonoverlapping sliding axes-parallel rectangular labels so as to maximize the total weight of the labeled features, provided that the ratios of label heights or the ratios of label lengths are bounded by a constant. This settles one of the last major open questions in the theory of map labeling. Rutter, I., Wolff, A.: Computing Large Matchings Fast.ACM Transactions on Algorithms.7,article 1, 21 pages (2010). In this paper we present algorithms for computing large matchings in 3-regular graphs, graphs with maximum degree 3, and 3-connected planar graphs. The algorithms give a guarantee on the size of the computed matching and take linear or slightly superlinear time. Thus they are faster than the best-known algorithm for computing maximum matchings in general graphs, which runs in \($O(\sqrtnm)$\) time, where \($n$\) denotes the number of vertices and \($m$\) the number of edges of the given graph. For the classes of 3-regular graphs and graphs with maximum degree 3, the bounds we achieve are known to be best possible. par We also investigate graphs with block trees of bounded degree, where the \($d$\)-block tree is the adjacency graph of the \($d$\)-connected components of the given graph. In 3-regular graphs and 3-connected planar graphs with bounded-degree 2- and 4-block trees, respectively, we show how to compute emphmaximum matchings in slightly superlinear time. Goaoc, X., Kratochvíl, J., Okamoto, Y., Shin, C.-S., Spillner, A., Wolff, A.: Untangling a Planar Graph.Discrete & Computational Geometry.42,542--569 (2009).